It’s quiet, almost too quiet. The hangovers in the US post the lowest scoring Superbowl in history sets the tone for trading today as many wait for more news and something to spike their coffee before getting excited about markets. The lack of new themes makes markets look boring and that lifts up the usual beta plays of selling volatility and chasing yield. The Xi/Trump meetings maybe set for Feb 27-28 in Da Nang according to the South China Morning Post. This coupled with the Lunar Holidays in much of Asia and a slightly better China Services PMI left markets waiting for Europe. The recognition of Guaido as Venezuelan President by nine EU nations along with the US puts oil higher with Brent at $64 and some of those disinflation fears easing accordingly. This hasn’t helped INR or some equities in Europe. As the all-clear for risk sirens blare today ECB Nowotny boldly suggest there is no recession risk even as all the present indicators suggest the 1Q soft patch is worse than 4Q. The Sentix investor sentiment for Europe drops to -3.7 from -1.5 – its sixth month of weakness and the worst since November 2014. The point being that the lack of interest in safe-haven’s today doesn’t mean markets are safer, only less fearful. 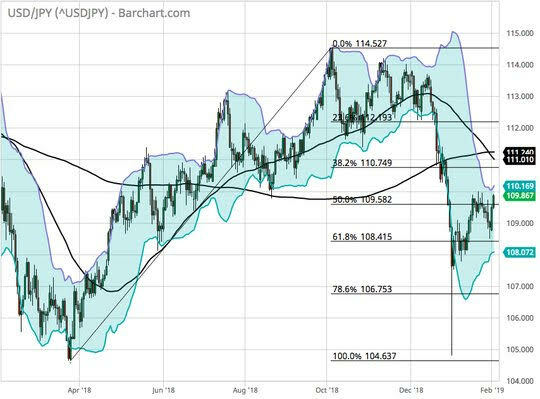 This puts the USD/JPY as the bellwether to watch with an eye to gold and CHF as well. Question for the Day:Is Asia growth at risk? The China Services PMI was better today but the ASEAN Manufacturing PMI points to the pain in that sector getting worse. Domestic growth will lead in emerging markets making the present US/China trade focus and the FOMC pause less important to sketching out the bigger picture of growth for 2019. The ASEAN January Manufacturing PMI slips to 49.7 from 50.3 – the first drop in 3 months with six of the seven nations reporting lower PMI. Lower inflation is the boon, but only if domestic policy pushes can counterbalance export weakness. Perhaps the most important part of the story is that overall business outlook 12-month forward is still positive – with many hopeful new orders rebound. Asian corporate CEOs seem to be betting on a US/China trade deal.